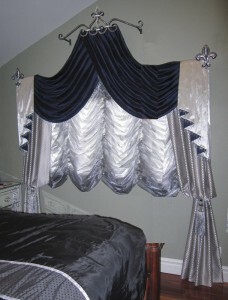 The right drapery hardware can make your window treatments go from simple to sensational. Decorative drapery hardware has evolved to include unique elements in many design styles and finishes. There are embellished wood rods, metal rods, finials, tie-backs, drapery medallions and drapery jewelry that can add beautiful detail to the window treatment. “Decorative hardware can set the decorating style and theme of a room or home,” says Denise Schenck, marketing manager for Lafayette Interior Fashions. Drapery medallions can be positioned so that they frame the window perfectly. This is one of Anna’s latest designs. It is a swag treatment mounted on a Swarovski crystal encrusted crown with fleurdele medallions and a bishop sleeve tied panel. This is a beautiful Swarovski crystal encrusted drapery pendant. Drapery hardware adds a special touch to window décor and serves an important purpose. After-all, great design is defined by functionality and attention to detail. It is always smart to consult a professional window stylist to make sure all the bases are covered.